Valentine’s Day and the Garage Door need not be drab and dreary. Both are meant to be fun, not simply functional (yes, even your garage!). V-Day stimulates relationships while the garage door can be decorated to show that special someone just how zany your love really is. Here are five fun ways to decorate the garage door this Valentine’s Day. Big Ribbon and Bow – Simple and sweet, get a long, wide, red ribbon and attach it over the garage door as if around a wrapped gift. Be sure to find a ribbon that is at least six inches in width and measure the door in advance. 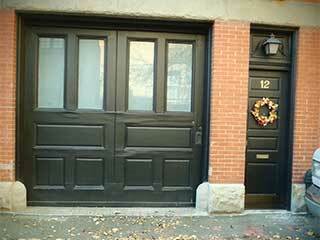 An average two-car garage door will be 15 x 7 feet. If wrapping around top to bottom, left to right, at least 46 feet of ribbon will be needed. But make sure the inside is more than oil spots and old tools (unless it’s a gag gift of course). Paint a Big Red Heart over the Door (and part of the house) – Paint is a great way to alter the appearance of anything. Of course, you want to be sure to use something not-too-permanent like enamel. Instead, look for temporary, washable paint. Flashing Multi-Color String Lighted Heart – Long strings of LED lighting is easy to obtain and just as easy to attach. Because the lighting is lightweight, attaching it to the garage door will not require screws or any other such hardware which would damage the surface. And as a plus, it can be reused for every other holiday. Go Traditional with Paper Hearts, Cupids, and Lettering – Of course, a trip to any party store will provide an abundance of traditional paper, plastic, and unknown materials cut into Valentine’s Day favorites. Go crazy with these and some tape. The best part is that removal is simple and time-efficient. Attach an Evening Gown to the Outside with Lingerie Attached Inside – For the more risqué, get her a new evening gown and surprise her by attaching it to the outside of the garage door. Then imagine her surprise on entering the garage only to find that the rest of the outfit is opposite the dress. Of course, if you really want to get the attention of the neighbors, a simple reversal of the garments on the door should do the trick.